From pressure washers to ATEX vacuums, Morclean has it all. Over the years we have formed the biggest and best fleet of Bin Wash machines on the market, all with features to suit every need. We pride ourselves on extensive research and development and that’s why the Custom XL is the safest Bin Wash in our range. The Custom XL model separates itself from the rest of the Bin Wash range and introduces a new platform, which allows the operator to safely clean bins roadside, without being directly on the road. As well as providing additional roadside safety, the raised position offers a better angle allowing the user to get right into all of the nooks and crannies for a more thorough and deep clean. This robust machine has the capacity to lift 3 x 240 litre domestic bins and 1 x 1100 litre commercial bins, which increases productivity and reduces time spent at the roadside. Another great feature of the Morclean Custom XL, is that it is self-contained and fitted with a hot water system, which allows the machine to generate its own hot water, for that extra cleaning power. The Custom XL is no longer restricted to just bin washing, it can be used for mobile HGV or plant washing, building cleans, drain cleaning and patio cleaning, just to name a few. For more information, please get in touch with our experienced sales team on 0800 1300 402 or send us an email at info@morclean.com Not what you're looking for? 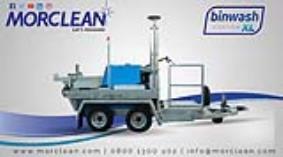 Check out the rest of our Bin Wash range and the rest of our product offerings via our website at www.morclean.com Want to see it in action? Call for a no obligation, free demonstation now!